Let's get excited for We The Fest 2019! 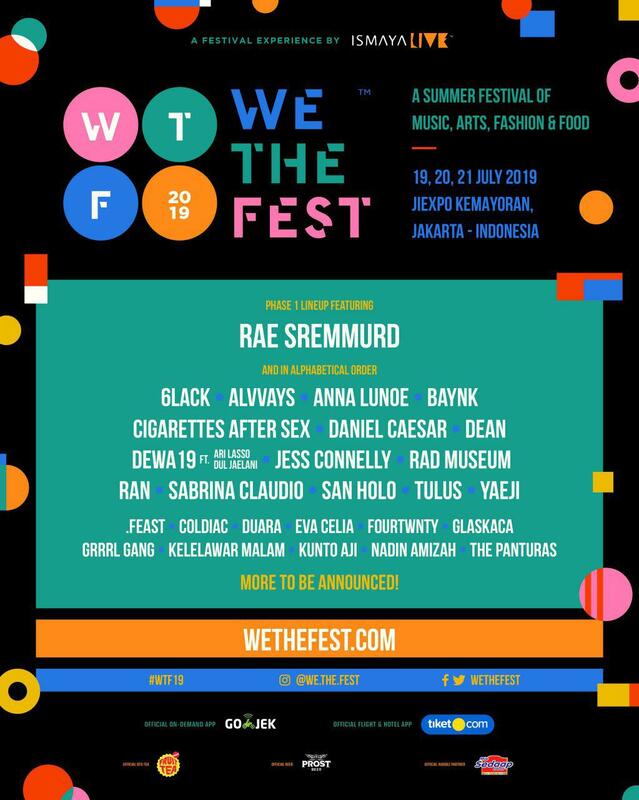 We The Fest is an annual summer festival of music, arts, fashion and food taking place in Indonesia's capital of Jakarta. Since its inaugural edition in 2014, the festival has seen incredible performances from globally-known acts of different genres including The Kooks, Dua Lipa, James Bay, SZA, Miguel, Ellie Goulding, Big Sean, The 1975, G-Eazy, Mark Ronson, Phoenix, Macklemore & Ryan Lewis, CL, The Temper Trap, Purity Ring, Flight Facilities, Jessie Ware and many more. Indonesia's most exciting musical acts have also performed at the festival including Potret, NAIF, Scaller, Barasuara, Sheila on 7, Raisa, The Trees and the Wild, Ramengvrl, Elephant Kind, and Stars & Rabbit amongst many. In 2018, the fifth edition of We The Fest took place on the grounds of JiExpo Kemayoran at the heart of Jakarta, and was a wonderful home to over 60,000 punters from over 30 countries. Described as "a classy festival" by Vice for its friendly vibe and how slickly it has been organized, the festival is a pioneer of its kind in the Southeast Asian festival scene with elements such as arts, fashion and food presented through various whimsical activations and zones festival-goers can experience and explore. We The Fest is returning for its sixth edition on 19, 20 & 21 July 2019. Get your We The Fest 2019 ticket at www.maimilu.com now!